I recall a post similar to this before I went to Andros. That post went straight to my head and it got stuck there and it seems most of my bonefish flies since that time have been influenced by that one post. Here is a recent post from Deneki about what your Andros flies should take into account. Big but light. South Andros bonefish are big, and big fish tend to like bigger meals. At the same time, though, we fish a lot of really shallow water since our fish tend not to be spooky. 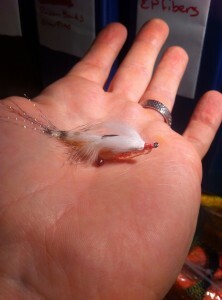 I see the imprint of Deneki’s advice in my fly box… like this one. This entry was posted on Wednesday, October 23rd, 2013 at 3:24 am	and is filed under Flies. You can follow any comments to this entry through the RSS 2.0 feed. You can leave a comment, or trackback from your own site.